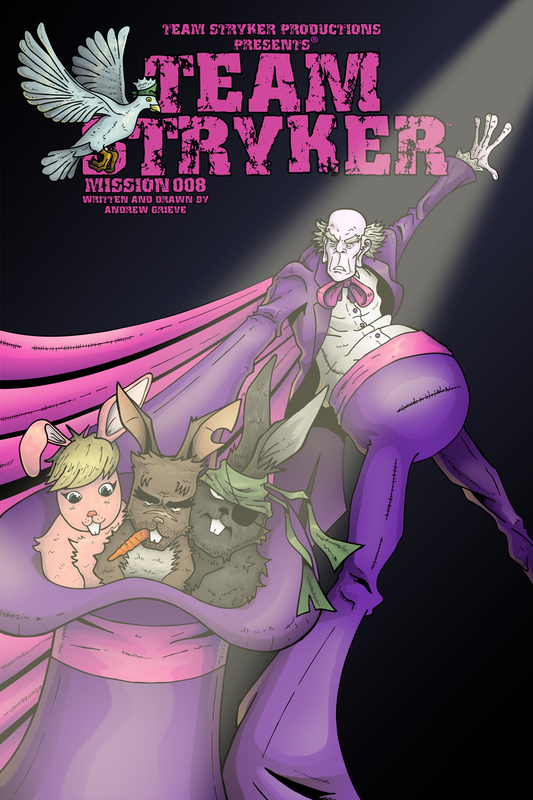 Welcome to Team Stryker Mission 008! This is the first time that I’ve put the villain of an issue front and center of a cover. The more covers I do the harder it becomes to find something for each member of Team Stryker to do, but I really liked the idea of The Sad Magician being on the cover. I didn’t want to mess around with this one and just jump straight into the action. I always enjoyed the older Spider-Man covers where it felt like the cover could’ve almost been a page taken out of the issue. For all of the new Team Stryker fans, welcome! I hope you have as much fun reading Team Stryker as I do making it. For returning fans, I’ll be changing a few things up for this issue. For starters, I won’t be showing the inks and pencils on Wednesdays and Fridays respectively. I had a few requests to make it easier to read an issue from start to finish with less clicking through the pencils and inks. Your requests have been answered! I’ll be looking to post the pencils and inks somewhere else like the Team Stryker Facebook or Twitter page for those of you that enjoy seeing the process. I hope you all enjoy Mission 008 and feel free to let me know what you think of it in the comments or on Facebook and Twitter. YAY! Can’t wait for this issue!